Google’s annual developer conference kicked off today with an unsurprisingly sweet Android announcement. 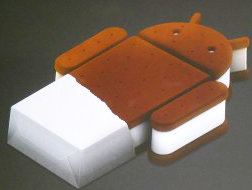 The next mobile OS, Android 4.0, will be dubbed Ice Cream Sandwich and has a fittingly cute logo to boot. Among the new developer API goodies are an impressive 3D display system that can detect spatial movement, ala Microsoft Kinect. ICS devs will apparently be able to use minute facial gestures, such as eye movement, as input. The practical usage of which (beyond being totally future-y) remains to be seen. Cupertino is notoriously tightlipped about unreleased products, but it appears Google has gotten the jump on Apple here, assuming rumors of next-gen iDevices’ 3D screens are true. It will be interesting to see how the two mobile giants play the 3D card in their distinct styles. Android 4.0 devices will be able to act as USB hosts- meaning direct media importing across devices, as well as a “ridiculous” number of input devices, such as Xbox gamepads. Ice Cream Sandwich is designed to be “one OS that runs everywhere,” a statement alluding in part to the fact that Google TV will now run 4.0. Hopefully it also means the Android team will be addressing some of the widening hardware fragmentation issues that have continued to challenge Android developers. Thought on Ice Cream Sandwich? Use The Comments! Mike Keller is GeekTech's resident iOS developer nerd. Catch Diary of a Developer every Tuesday here at PCWorld's GeekTech blog.